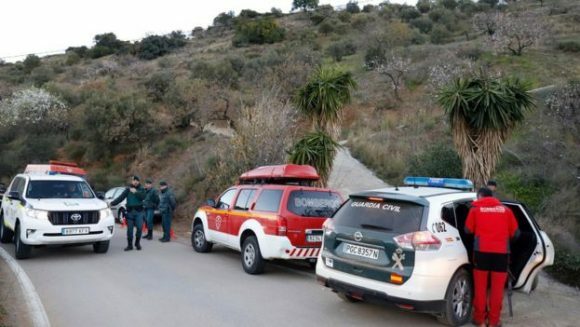 Spanish officials have confirmed that a two-year-old toddler is trapped in a deep and narrow borehole, following a search by emergency services and the recovery of the boy’s packet of sweets and a cup in the borehole. Spanish media say the boy, named Julien, was seen falling into the hole which is just 25 cm wide and about 100 metres deep, when he was with his family who were out walking in Malaga, Southern Spain. Jose’ Rosello, the boy’s father, told the media he waas confident his son would be recovered alive. Julien’s parents have already lost another son in an accident two years ago. Emergency services are using cameras to try and identify the exact whereabouts of the boy, but a soil blockage is hindering access. Spanish Police have confirmed that members of a Swedish company which had assisted in the rescue operation of 33 miners in Chile, who had been brought out alive after 69 days underground seven years ago, are also helping in this operation, and other means of access to the borehole are being studied.